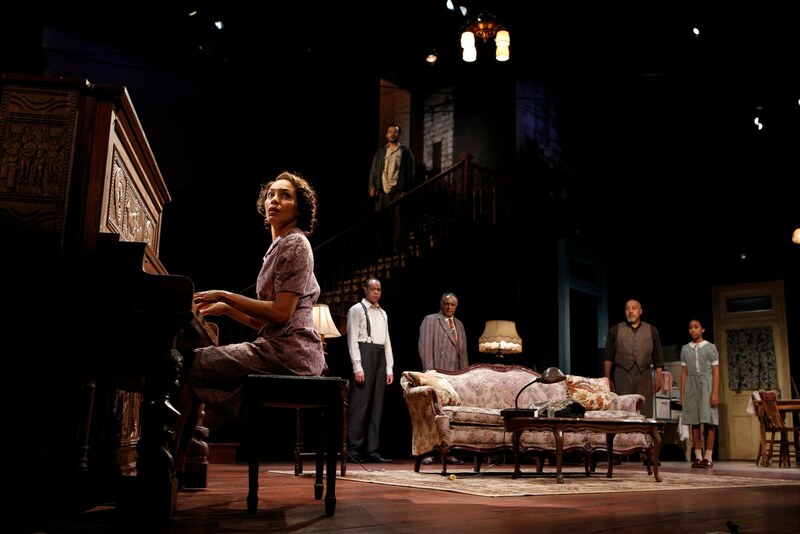 The cast of August Wilson's The Piano Lesson. Photo © Joan Marcus, 2011. An old piano, with carvings of the images of family members once owned in slavery, binds a family to their past and prevents them from finding the key to a new future in August Wilson’s The Piano Lesson, enjoying a run through Feb. 19 at Yale Rep, where the Pulitzer-Prize-winning play made its debut 24 years ago. A fine ensemble cast does the play justice as the 1936 Pittsburgh home of the Charles family, comes to life in the fourth in the playwright’s Pittsburgh cycle, 10 plays examining the African-American experience, primarily in Pittsburgh. 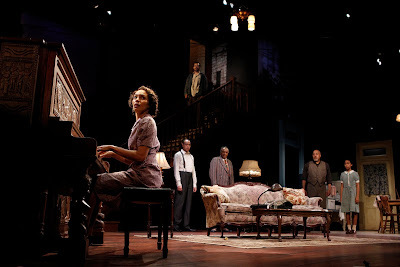 The set is interestingly designed by Dede M. Ayite so that we see the interior living room and kitchen as well as an exterior backdrop of the neighborhood beyond a stairway leading to the second floor, where people start seeing a ghost of Sutter, a man who owned the land the family once worked as slaves and who possibly was murdered over a dispute about the piano. Bernice (Elisa Davis, who also provides original music for Wilson’s lyrics) lives in the home with daughter Maretha (Melenky Welsh) and her Uncle Doaker (a delightful Keith Randolph Smith). Though want-to-be preacher Avery (Tyrone Mitchell Henderson) is courting Bernice, she’s not ready to commit to the relationship and play the piano to lead the choir in congregation. In fact, the widow, still grieving the loss of her husband who died in an incident related to the piano, hasn’t played the instrument in years. Seeing an opportunity to sell the collectible folk-art piece and use the money to purchase the land is Bernice’s brother Boy Willie (LeRoy McClain), who shows up with his friend, Lymon (Charlie Hudson III) to cart it away despite Bernice’s constant assurances that she won’t sell. Rounding out the cast is a capable Charles Weldon as Wining Boy, Doaker’s brother. The ensuing story is moving and gives us that wonderful glimpse into the lives of people for which Wilson is known. Director Liesl Tommy lets the pace slag a little on this production, however, with some scenes feeling like they grind to a halt. It feels even longer with full renditions of songs, repetitive dialogue in the story and an incredibly generous intermission (full run time was nearly three and a half hours). The play, with its ghostly special effects (Junghoon Pi, sound design; Alec C. Edwards, lighting design), is a nice glimpse into the lives and values of these family members. Watch a video trailer by clicking here. Tickets range from $10 to $85 and are available at www.yalerep.org, by phone at 203-432-1234, and in person at the Yale Rep Box Office, 1120 Chapel St. at York Street, New Haven. Student, senior, and group rates are also available.